Eugenio Garza and Bariano. Photo Credit ©Sportfot. Mill Spring, NC – October 14, 2018 – Eugenio Garza (MEX) celebrated his longtime mount, Bariano, after their 33.01 second jump-off round to win the $35,000 1.45m Sunday Classic CSI 3* at Tryon International Equestrian Center (TIEC). Karen Polle (JPN) claimed reserve honors aboard her own Little Lord 90, a 2005 Holsteiner stallion (Lasino x Calato), clearing the short course in 34.835 seconds, while Kristen Vanderveen (USA) and Bull Run’s Almighty charged to third place on a 35.043 second performance by the 2008 Hanoverian gelding (Caspar x Quidam De Revel) owned by Bull Run Jumpers Six LLC. The course set by Michel Vaillancourt (CAN) saw 29 horse-and-rider pairs attempt the first round, with 12 entries returning for the short-course test. Early in the order of go, Garza and the 2001 Belgian Warmblood gelding (Jetset-D x Skippy) owned by David and Monica Garza put in a blazing clear performance that couldn’t be beaten. As he looks ahead to competing in the Tryon Fall 4 CSI 5* next week before returning to Mexico, Garza will be partnering with another mount, but Bariano’s job well done for Garza over the years will remain front and center. Holly Shepherd of Grand Bay, AL piloted MTM Making Waves for owner Mary Antonini to victory in Friday’s $10,000 USHJA National Derby at TIEC, producing a two-round score of 172. Reserve honors went to Mountain Brook, AL native Timothy Maddrix and Missy Nolen’s Man Up, taking home a score of 171, while Shepherd also collected third place honors aboard Barbara Risius’ Longstreet, scoring 168.5. For full results from the $10,000 USHJA National Derby, click here. For full results from the $35,000 1.45m Sunday Classic CSI 3*, click here. Photo: Holly Shepherd and Tybee. Lexington, Ky. – Aug. 17, 2018 – Celebrating its 10th anniversary, the 2018 USHJA International Hunter Derby Championship returned Friday to the Kentucky Horse Park for the first of two days of competition, bringing along with it 83 of the country’s top hunter horses and athletes. Since 2012, the program finale has steadily increased in prize money, and this year is no exception, with the overall purse nearing $300,000, a welcome incentive for the collection of skilled entries. With only 40 slots in Saturday evening’s championship handy round up for the taking, competitors needed to showcase themselves well enough to earn a place in the top half of the scorecard to retain a shot at the title. Rising to the challenge in the face of an onslaught of rain, Tybee carried Holly Shepherd to the highest marks of the day to emerge as the early front-runners ahead of a field comprised of both veterans and newcomers. The 2018 championship, held inside the Rolex Stadium for its ninth year, featured a 12-effort track from designer Alan Lohman, who chose to implement plenty of lofty oxers and the standard four high-option fences for exhibitors to highlight their precision and scope. As the 10th pair in the order-of-go, Jamie Taylor aboard Iwasaki and Reilly’s Small Kingdom set the bar high for subsequent contenders with a total tally of 266 points. The top slot soon changed hands, however, as three-time champion and veteran hunter rider Liza Boyd piloted Maggie Hill’s Tradition just nine trips later to the first 90 score of the day, accompanied by an 86, 89 and 12 bonus points to overthrow the early leaders with a whopping 277 points. Intermittent downpours of rain plagued the morning, and Shepherd and Holly Brown’s Tybee were one of the unlucky pairs to have to face the elements for their classic round. The skilled duo overcame the added difficulty, earning scores of 88, 91 and 92, in addition to 12 bonus points, for cumulative marks of 283 to usurp Boyd and Tradition for the throne with more than 50 partners still left to ride. As only the 25th to take their turn around the ring, Shepherd and Tybee anxiously waited to see if their place atop the leaderboard would hold. On her second ride of the day, reigning champion Victoria Colvin and Brad Wolf’s Private Practice gave the top contenders reason to worry, electing to jump all four high-options and pulling in a total score of 279, just four points shy of the lead. As 54 more entries continued to come forth throughout the morning and afternoon, many with the benefit of sunny skies, the cut-off score for 12th place continued to rise, ultimately settling on 267.50 as challengers consistently illustrated exceptional rounds that raked in scores in the 80s. However, none were able to catch the leading trio of Shepherd, Colvin, and Boyd, each of whom rode within the first 30 in the line-up and only a few trips from each other. Heading into the final handy phase of competition, Shepherd and Tybee will face off against a group of top talent, aiming to retain their spot at the head of the class as the last to ride Saturday. Just points off the lead, Colvin undoubtedly hopes to match her 2017 results, jumping from third place after the classic round to the championship tricolor and largest prize money check of the competition thanks to a standout handy portion. No stranger to the winner’s circle and always a threat to the leader, Boyd managed to maneuver her way into both the third and fourth place spots with Tradition and Finally Farm and Westerly Farm’s Clemens, respectively. Tied with Clemens’ score of 276.50 is Tracy Freels’ Red Ryder with Hannah Isop at the helm, while Jenny Karazissis held the reins on the sixth highest-scoring horse, Dulcie Lou Morris’ Big Shot. Seasoned derby riders, Holly Shepherd of Grand Bay, Alabama and Tim Maddrix of Leeds, Alabama, battled it out for the top placings in the $10,000 USHJA International Hunter Derby over a course designed by Paul Jewell of Lambertville, New Jersey. Twenty-five horse and rider teams took to the oval arena and it was Derby Queen Holly Shepherd of Grand Bay, Alabama and Nina Moore’s Kodachrome who took home the blue ribbon for their overall score of 375. Special, owned by Missy Nolen and ridden by Tim Maddrix of Leeds, Alabama, earned a second place ribbon with their overall score of 363, and Shepherd returned for a third place ribbon in the irons of Belle Rolfe’s Cesar De Lison Z for their overall score of 362. Maddrix returned to the winner’s circle for the fourth place ribbon, this time aboard Margaret Camp’s Cascaron, for their overall score of 349. Michael Leon of West Hollywood, California took the fifth, sixth, and seventh placings with Kelly Sims’ True Enough [348.50], his own Nil Du Buffan [347.50], and Sims’ True Story . Sarah Milliren of Athens, Georgia and Liddy Strickland’s Valentine placed eighth, ninth was awarded to Allison Reichenbach’s High Life, ridden by Danielle Grice of Northfield, Tennessee, and tenth went to Vick Russell of Columbus, North Carolina and his own Tall Paul. Eleventh and twelfth were awarded to West Meadow Farm, LLC’s Fergus, ridden by Daniel Geitner of Aiken, South Carolina, and Wimberly Debono’s Indecision, ridden by Maddrix. Julie Curtin of Woodstock, Georgia took the top two placings in the $2,500 USHJA National Hunter Derby, presented by Kruse Cushion Ride, besting a field of 23 horse and rider teams over a course designed by Paul Jewell. Curtin and Cheryl Rubinstein’s Capisce took the class with their combined score of 179.5, but beating Curtin’s second ride, Rebekah Warren’s Cassico, by only half a point. “In the Handy round, Capisce and I had a couple of options. We took the inside turns and he was really smooth and extremely handy which made for a good trip. He just edged out my other horse, so it was really close,” she said. Final results had Holly Shepherd of Grand Bay, Alabama taking the third and fourth placings with Belle Rolfe’s Boure and Micaela Kennedy’s Magnus Hermes, respectively, with overall scores of 175 and 174. Kelly Sims’ Eleventh Hour, ridden by Michael Leon of West Hollywood, California, placed fifth with their overall score of 171.5, and Eleese Shillingford’s Odyssey, ridden by Carolyn Bell of Alpharetta, Georgia, placed sixth with their overall 171. Sabina Holtzman of Clayton, Missouri and her own Jerez Mail earned a seventh place ribbon and Cassino Royale, owned by Anna Huggins and ridden by Clay Alder of Germantown, Tennessee, placed eighth. 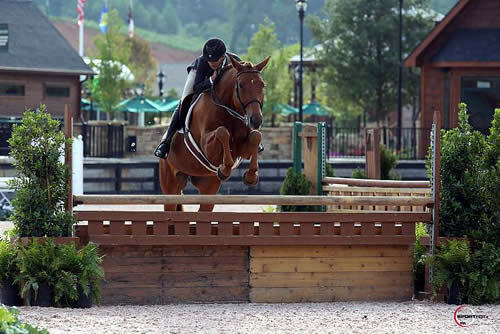 Shanna Beyer’s Lacoste, ridden by Mary Mielenz of Collierville, Tennessee, earned a ninth place finish, and Curtin returned for a tenth with Select Sport Horses’ Hudson for a tenth place ribbon. SLF Bellarena, ridden by Daniel Geitner of Aiken, South Carolina and owned by Helen Byrd, placed eleventh, and Hannahlea, owned by Kelly Sims and ridden by Maggie Diehl of Alpharetta, Georgia, wrapped up the class with a twelfth place. “I’ve ridden Cheryl’s horse before, but I rode him as a Pre Green. I was excited when Phoebe and Cheryl asked me about a week ago to ride him,” said Curtin. “He’s [Capisce] has really matured and grown up a lot and we just clicked right away. He’s a wonderful horse and I felt so comfortable on him. “Paul used the same course for us as the International Hunter Derby and it rode really well for both heights,” she added. “It was open, flowing and there were lots of single jumps. Because the arena is very long, but not as wide, he did a great job on making it flow. He put a couple of jumps at the end of the ring because it was so long he had to use some of the width. The very first jump was on the end of the ring and the horses had to pay attention at Jump 1,” she commented. “But Paul let us finish with a nice long run to an oxer for our last jump which was really nice. Holly Shepherd of Grand Bay, Alabama and Loretta Patterson’s Sky High galloped away with their first Grand Prix win in the $40,777 Kruse Cushion Ride Grand Prix, presented by the City of Gulfport, on a course designed by former Assistant Olympic Course Designer for the 1996, 2000, 2004, 2008 and 2016 Games, Manuel Esparza of Mexico City, Mexico. Esparza set the first round time allowed at 83 seconds. “The course was well designed and had a nice flow to it. Early on the course looked pretty good, and there weren’t any big tricks, but it rode a little backwards,” commented Shepherd. “You’d jump in fast but then have to slow it down, hurry up, slow down,” she said. “The jumps were big and the time allowed was really tight,” she added. Carson Grisham of Southlake, Texas and her own Crack De Muze, winners of the $10,000 Horseflight Open Welcome two days earlier, were the first horse and rider team to turn in a clear first round in a time of 49.566 seconds. Four rides later, Shepherd and Sky High insured there would be a jump off with their clear first round in a time of 82.345 seconds. Shannon Hicks of Lake St. Louis, Missouri and Helen Gilbert’s C’Havinia followed Shepherd with the next clear first round in a time of 82.706 seconds and would round out the jump off roster. Grisham and Crack De Muze were the first to go in the jump off and turned in a fault free round, beating the time allowed of 59 seconds with their own 49.566 seconds. Shepherd and Sky High were next to go. “My jump off plan was to leave the strides out, rather than slow it down,” she said when asked about her strategy. “He loves the field, and he’s a great galloper,” Shepherd said. “He’s a little slow in the air, but he has such a big stride it’s really beneficial,” she added. And beneficial it was. Shepherd and Sky High, also known as “Pete”, turned in a fault free second round in a time of 48.745 seconds, setting the new time to beat. When Hicks and Emir D retired from the second round, Shepherd and Sky High were crowned the victors. “I’ve had him for about nine months. He’s got a great personality, loves to be scratched all over and is a really great horse. We’ve been doing the Grand Prix and he’s ribboned quite a bit, but this is our first win. We did a bit change a couple of weeks ago in order to maintain his step and shape, and I think we maybe found the magic. I feel like we’re on the right path and we’ll be showing here the next two weeks,” said Shepherd. Matt Cyphert of Northlake, Texas picked up fourth and fifth place ribbons in the irons of Hannah Donald’s Hector for their one time fault first round in 83.209 seconds and his own Lochnivar who earned three time faults in their first round in a time of 85.314 seconds. Sixth place went to Frank Owens of Windcrest, Texas and MTM Holdings, LLC’s MTM Twenties Girl with their four fault first round in a time of 78.874 seconds, and Penny Brennan of Buhl, Alabama and her own Sun Tzu placed seventh with their four fault first round in a time of 79.737 seconds. Hicks and Helen Gilbert’s C’Havinia placed eighth with their four fault first round in a time of 80.742 seconds and Dominique Damico of Berwyn, Pennsylvania and her own Canoso placed ninth. Tenth was awarded to Jorge Ludwig of Newbury Park, California and his own Lamarique, Colleen Acosta of Roanoke, Texas and Evalyn Grace LLC’s Himini earned eleventh, and Laura Connaway of Little Rock, Arkansas and her own Ceralena wrapped up the class with a twelfth place finish. The $10,000 Horseflight Open Welcome took place on Friday and sixteen horse and rider teams tackled the course designed by Manuel Esparza. The first round was set with a time allowed of 89 seconds and eight horse and rider teams advanced to a second round opportunity. Shannon Hicks and Helen Gilbert’s Emir D were the first horse and rider team to turn in a clear first round, and their clear second round in a time of 46.642 seconds, set the new time to beat. Frank Owens and DS Holdings, LLC’s MTM Twenties Girl followed Hicks with double clear rounds. Their clear second round in a time of 43.967 moved Hicks and Emir D into second position and they took the lead. The lead was short lived when Jorge Ludwig and his own Lamarique followed suit, turning in double clear round and a second round in a time of 43.365 seconds and set the new time to beat. Laura Connaway of and her own Ceralena followed Ludwig with a clear first round and advanced to the second round. Four faults in a time of 48.168 would see the pair finish in eighth place overall. Cerulean Stables, LLC’s HHS Louis, ridden by Penny Brennan, were the next horse and rider team to turn in a clear first round. Their fault free second round in a time of 43.721 seconds would see the pair finish in third place overall. Holly Shepherd and Loretta Patterson’s Sky High followed with the next clear first round effort. Their second round resulted in four jump faults in a time of 44.630 seconds which would find them with a seventh place finish. Carson Grisham and her own Crack De Muze followed Shepherd and Sky High with double clear rounds and a second round time of 42.222 which took the lead. Matt Cyphert and Hannah Donald’s Hector, winner of last week’s $25,000 CWD Grand Prix, followed Grisham, but their second round saw four jump faults in a time of 43.126 seconds which would find them finishing in sixth place overall. Final results had Grisham and Crack De Muze with the win and Ludwig and Lamarique in second. Brennan and HHS Louis picked up third and Owens and MTM Twenties Girl placed fourth. Hicks and Emir D finished in fifth and Cyphert and Hector picked up sixth place. 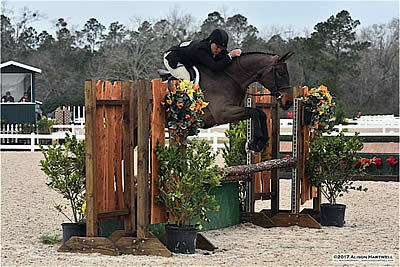 The $10,000 USHJA International Hunter Derby kicked off the hunter action Week II at the Gulf Coast Winter Classic Circuit. Helen Gilbert’s White Lightening, ridden by Holly Shepherd of Grand Bay, Alabama, galloped away with the blue ribbon after earning the highest Classic and Handy Round scores of 174 and 189.5, respectively, for a combined 363.5. The second place ribbon was awarded to Fairfax, owned and ridden by Liz Hudspeth of Alpharetta, Georgia, after earning a Classic Round score of 160 and a Handy score of 187 for a combined 347. Love Game, owned by EMC International and ridden by Evan Coluccio of Middleburg, Virginia, earned a third place ribbon with their first round score of 162 and Handy Round score of 174 for a total of 336 combined points. Coluccio returned for a fourth place ribbon in the irons of Larry Antonini’s Six Pack after earning a Classic Round score of 159 and a Handy score of 155 for a total of 314. Estander, owned and ridden by Leah Toscano of Chesterfield, New Jersey, placed fifth after earning 150 points in their Classic Round and a score of 154 for a total of 304. In the Black B, owned and ridden by Liana Brown of Carmel, Indiana, took home the sixth place ribbon after earning a first round score of 140 and a Handy round score of 163 for a combined 303. Seventh was awarded to Allure, owned and ridden by Gianna Cobb of Marietta, Georgia, for their combined score of 302. Nemesis, owned by Daniel Damen and ridden by Dominique Damica of Berwyn, Pennsylvania, was awarded eighth place. Coluccio returned to the arena for both the ninth and tenth place ribbons with Ellen Addison’s El Tindo and Mary Antonini’s Rocking the Boat. Autograph, owned and ridden by Tim Sweat of Milton, Georgia, placed eleventh. The $2,500 USHJA National Hunter Derby followed the International Hunter Derby and Jason Berry of Verona, Virginia and Kirsten Martin’s Cammarata took the win, besting sixteen horse and rider teams. Enticement, owned by Rebekah Warren and ridden by Julie Curtin of Woodstock, Georgia, was awarded a second place while Kaitlyn Williams of Wayne, Pennsylvania and her own Balouette placed third. Berry returned with EMO Stables’ Capiche to pick up the fourth place ribbon and Katie Thomas’ Yahtzee, ridden by Kelley Buringa of Northlake, Texas, earned fifth place. Liana Brown of Carmel, Indiana rode her own Marengo to a sixth place finish. Curtin returned to the winner’s circle to pick up the seventh place ribbon this time in the irons of Wesley Wilson’s Whitny and Robin Hood, owned by Jacob Brupbacher and ridden by Mary Antonini of New Orleans, Louisiana, placed eighth. HC Sport Horses’ HC San Patrignano, ridden by Lucy Heaton of Clarksdale, Mississippi, placed ninth and Katrina Seitz’ Notre Montrachet, ridden by Amy Tilson Ochoa of Zionsville, Indiana, finished in tenth place. Lily Gumenick of Richmond, Virginia rode her own Summit to an eleventh place finish and Hil Cat Farm’s Casting Call, ridden by Catherine Castle of Folsom, Louisiana, finished in twelfth place. The hunter grooms were recognized Friday thanks to Sheila and Shirley Murphy. Tito Aguilar won the class and the cash award. Second place went to Missie Morrissey and third place was awarded to Josette Ward. “The grooms are often the unsung heroes of the horse show world and this class is a great opportunity to thank them for their commitment to the well-being of our horses,” said Bob Bell, President of the Gulf Coast Classic Company. The $2,000 Sidelines 3′ and 3’3″ Green Hunter took place and for an entry fee of $5, Jason Berry and Kirsten Martin’s Cammarata won the 3’3″ Green Hunter Championship and Julie Curtin and her own Honey Badger won the 3′ Sidelines Green Hunter Championship. Twenty-three horse and rider teams competed in Week II’s $2,000 Sidelines Green Hunter Division and it continues to be successful, largely in part of Sidelines Magazine’s sponsorship of the Green Hunter Division offered for only a $5 entry fee. “Sidelines is happy to sponsor this division which is so important to the development of our Hunter horses,” commented Bradley Spragg, Publisher of Sidelines Magazine. Andy Kocher and Cantu 5. The $50,777 Sidelines Grand Prix, presented by Beau Rivage Resort and Casino, closed out the 2016 Gulf Coast Winter Classic and the USHJA Dash for the Cash King, Andy Kocher of Ocala, Florida, galloped away with the win in the irons of Evalyn Grace, LLC’s Cantu 5. Of the twenty-eight that tackled the course designed by Paul Jewel of Lambertville, New Jersey, only eight turned in clear first rounds advancing to the jump off. Kocher rode Postage Stamp Farm’s Prof De La Roque as the first to go and posted a clear round in a time of 82.486 seconds, well within the 89 seconds time allowed. Kocher then piloted his own Leconte to a clear first round in a time of 84.603 seconds. He now had two rides in the jump off! Hester Equestrian, LLC’s Clueless P, ridden by Lauren Hester of Lexington, Kentucky, followed Kocher and posted a clear first round in a time of 79.972 seconds and added themselves to the jump off roster. Charlie Jayne’s Cupid Shuffle, ridden by Michael Tokaruk of Germantown, Tennessee, added themselves to the jump off round after posting a clear first round in a time of 79.117 seconds. Kocher returned to the grand prix field, this time in the irons of Cantu 5. The pair posted a clear first round in a time of 82.881 seconds, making it his third horse to qualify for the jump off. Christopher Schroeder of Wellington, Florida and his own Catungee also turned in a clear first round effort in a time of 87.767 seconds, qualifying for the jump off round. Missy Nolan’s Specialized, ridden by Tim Maddrix of Leeds, Alabama, joined the jump off roster after posting a clear first round effort in a time of 87.386 seconds. Schroeder and Marion Head’s Heliante were the last to go and clear they went in a time of 87.532 seconds and sat in the enviable last to go spot in the jump off order. Paul Jewell set the jump off time allowed at 57 seconds. Kocher and Prof De La Roque were the first to go, but an unintentional dismount would keep the pair out of the winner’s circle and settling for eighth place overall. Kocher and Leconte were next in the order but four faults in a time of 51.455 seconds would finish them in seventh place overall. Hester and Clueless P followed Kocher, but four faults in a time of 50.064 seconds would see them finish in fourth place overall. Tokaruk and Cupid Shuffle followed Hester in the order. Four faults in a time of 50.154 seconds would have move them into the lead as the fastest four-faulter, but with four rides left to go, there was still a chance for someone to go clear. And that’s exactly what happened when Kocher and Cantu 5 followed Tokaruk and turned in the first clear round in a time of 52.745, taking the lead and setting the new time to beat. Schroeder and Catungee challenged Kocher’s time and although they went clear, their time of 56.569 seconds would put them in second place behind Kocher and Cantu 5. Maddrix and Specialized followed Schroeder in the jump off order, but four faults in a time of 50.593 seconds would find them finish in sixth place overall. Schroeder and Heliante sat in the enviable last to go position and although they turned in the fastest jump off round in a time of 49.104 seconds, a heartbreak rail at the final fence would have them finish in third place, giving Kocher and Cantu 5 the win. “This was a great event and congratulations to Andy Kocher and Cantu 5 on their win today,” commented Bob Bell, President of the Gulf and Classic Companies as well as Classic Publications. “This is the first Sidelines Grand Prix since Classic Publications has purchased the magazine and I thank all of those who competed today,” he said. “All of you are part of Sidelines history now,” he added. Finishing in ninth place with one time fault was GK Performance Horses’ Diamant De Revel, ridden by Christopher Schroeder. Scott Lenkart and Fleur De Lis Farms’ Ziezo earned tenth place after posting the fastest four-fault round, and Sun Tzu, owned and ridden by Penny Brennan, placed eleventh. Brooke Kemper and Classified wrapped up the class with a twelfth place finish. Twenty-three horse and rider teams tackled the highly anticipated $10,777 Legend Jumper Derby on the world class Grand Prix field Saturday afternoon. The 1.30 m jumper classic, open to all horses not competing in the Grand Prix, had a time allowed of 120 seconds which only saw three go clean. 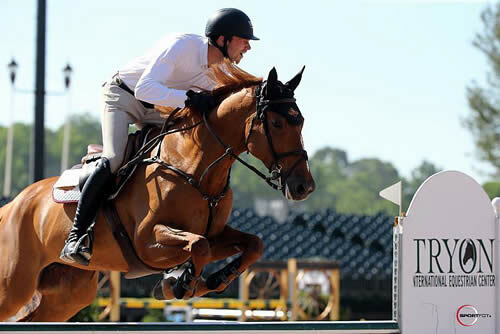 Christopher Schroeder of Wellington, Florida and Elizabeth Win’s Dubai B were the first to go and posted a clear round in a time of 101.824 seconds, setting the new time to beat. Newtown Jumping Jack, owned and ridden by Thomas Welsh of New York, New York, followed Schroeder and while they beat Schroeder’s time with their own 100.219 seconds, four jump faults would finish in eighth place overall. Alex Turner’s Vanrock, ridden by Michael Tokaruk of Germantown, Tennessee, posted a clear round and set the new time to beat at 97.926 seconds, taking the lead. Amanda Forte of Glenmoore, Pennsylvania and Cerulean Stables’ Rincoola Black Adder challenged Tokaruk and Vanrock’s time with their own 89.980 seconds. However, eight jump faults would find them out of the ribbons. Trapp O’Neal of Magnolia, Texas and Carolyn Elsey’s Quilona Z followed Forte and posted an eight fault jump round in 97.953 seconds, which would see them finish in twelfth place overall. Margaret Camp’s Charmeur, ridden by Holly Shepherd of Grand Bay, Alabama, tackled the course, but their time of 98.555 seconds with four jump faults would see them finish in seventh place overall. Eagle Valley Partners’ Coconut, ridden by Andy Kocher, followed Shepherd and turned in an eight fault round in a time of 93.638 seconds, which would find them finish in eleventh place overall. Kocher returned with his own Red Lady, but with eight jump faults in a time of 89.002, the pair would have them finish in tenth place overall. Rico S, owned and ridden by Sara Dees of Chatom, Alabama, followed Kocher and Red Lady and posted a four fault round in a time of 96.931 seconds and would finish in sixth place overall. O’Neal followed Dees in the order, this time in the irons of TKO Partnershjp’s Camero, and turned in a four fault round in a time of 100.990 seconds. They finished in ninth place overall. Riptide, owned by Christina Van Patten and ridden by Brooke Kemper of Culpeper, Virginia, followed O’Neal and turned in a four fault round in a time of 93.509 seconds and placed fourth overall. Holly Shepherd of Grand Bay, Alabama and Dejan Krunic’s Belle Clara DKS followed Riptide and turned in a lightning fast clear round in 91.474 seconds, taking the lead and moving Tokaruk and Vanrock into second place. Sitting in the enviable last to go spot was Kocher and Showcase 81, LLC’s Mullentine Imperial. The pair posted a time of 93.751 seconds, but four jump faults would see them finish in fifth place overall. “The $10,777 Jumper Derby is one of the most popular events at the Gulf Coast Winter Classic,” commented Bob Bell, President of the Gulf Coast Classic Company. “We are delighted that Merial and its product Legend sponsored this competition and appreciate their support,” he added. All press and sponsorship inquiries should be directed to Lisa Engel at lisa@classiccompany.com. The last $2,500 USHJA National Hunter Derby of the 2016 Gulf Coast Winter Classic took place yesterday and twenty horse and rider teams took to the hunt over a course designed by Allen Rheinheimer, Gulf Coast Classic Company’s Course Designer and Technical Coordinator. Holly Shepherd of Grand Bay, Alabama, who Week II earned the top three ribbons in the Gulf Coast Winter Classic Circuit’s $10,000 USHJA International Hunter Derby, proved herself again to be the ‘Derby Queen’ of the Gulf Coast after she led both the Classic and Handy Rounds in the irons of Sabina Holtzman’s Re Chiste. The pair earned a first round score of 88 and a Handy score of 89 for a total of 177 which awarded them a first place ribbon. Ramble On Farm’s Little Rock, ridden by Kaitlyn Williams of Wayne, Pennsylvania, finished in second place after earning a first round score of 87 and Handy score of 79 for a total of 166. Roland Park, owned by Mount Fair Equine, LLC and ridden by Dudley MacFarlane of Crozet, Virginia, followed in third with a first round score of 80.5 and second round score of 85 for an overall score of 165.5. Kathleen Caya of Oconomowo, Wisconsin, in the irons of Andy Kocher’s Icali, earned a fourth place ribbon after earning a Classic round score of 83 and a Handy score of 81.5 for a total of 164.5. Sarah Percy MacMillan’s Space Cadet, ridden by Callie Schott of Versailles, Kentucky, earned a first round score of 78 and a Handy score of 83 for a total of 161 and a fifth place ribbon. Sixth was awarded to Megan Martin’s Signature, ridden by Caroline Wilson of Germantown, Tennessee, after earning a Classic round score of 79 and Handy score of 83 for a total of 161. Honor, owned and ridden by Salter Hydinger of Birmingham, Alabama, earned a seventh place ribbon after earning a first round score of 76 and a second round score of 82 for a total of 158. Williams returned for the eighth place ribbon, this time in the irons of Ramble on Farm’s Shaq, after earning a first round score of 77.5 and a Handy score of 77 for a combined total of 154.5. Cathleen Driscoll of Elk Mills, Maryland rode her own Good Times to a ninth place finish after earning a first round score of 80 and a second round score of 74 for a combined total of 154. Hydinger returned for a tenth place ribbon, this time in the irons of her own Motivation, and Shepherd returned for eleventh place in the irons of Helen Gilbert’s White Lightening. Williams and Ramble On Farm’s Casan wrapped up the class in twelfth place. The two weekly $1,000.00 Pre-Green Hunter Divisions, offered for only $5.00 per horse, continued to see big numbers Week VI. Twenty-one horse and rider teams competed for the championship in the 3′ Division which welcomed Miki Moto, owned and ridden by Jennifer Jones of Ocala, Florida, to the winner’s circle. Reserve Champion honors went to Mindy Wurzburg, LLC’s Shipshape, ridden by Tim Maddrix of Leeds, Alabama. The $1,000 3’ Pre-Green Division awarded Rio Vista Farm’s Casswell, ridden by Jordan Gilchrist of Flower Mound, Texas, the Championship, and Reserve Champion honors went to Zorro, owned and ridden by Kathleen Caya of Oconomowo, Wisconsin. That was a $5.00 Division fee worth spending! “We are very happy that riders and owners took advantage of this special $5 Division offering at our Gulf Coast Winter Classic Circuit in Pensacola and here in Gulfport,” commented Bob Bell, President of the Gulf Coast Winter Classic. “In view of the popularity of this offering we are delighted to be offering the weekly $1,000 Pre-Green Divisions for only $5.00 per horse at the inaugural Jacksonville Spring Classics this April,” he said. Next week the Atlanta Spring Classic gallops onto the historic Georgia International Horse Park for two weeks of AA competition and more than $200,000 up for grabs! It’s not too late to reserve a stall. Email Jonathan@classiccompany.com and then enter online for no additional fees at horseshowsonline.com. Holly Shepherd of Grand Bay, Alabama established herself as the Derby Queen when she pulled a hat trick Friday morning, taking the top three placings in the $10,000 USHJA International Hunter Derby on a course designed by Nancy Wallis of Lambertville, New Jersey. Shepherd held the top two highest scores after the first round with Loretta Patterson’s Triompf with a score of 183 and Helen Gilbert’s White Lightning with a score of 163. Tim Maddrix of Birmingham, Alabama and Alina Dumitrescu’s Shutterbug sat in third position after earning a first round score of 162. Amanda Forte of Glenmoore, Pennsylvania sat in fourth with Rebecca Patterson’s Vecchia Murano with a score of 161, and Shepherd and Barbara Risius’ Longstreet were on their heels with a score of 161.50. Shepherd held the lead with Triompf in the Handy round after posting a score of 203 for a combined total of 386 which would win the class. White Lightning earned a second round score of 190 and a combined 353 which would award them the second place ribbon. Longstreet earned a second round score of 192 and combined with their first round score of 161.50, moved them into third place. Dergin Park, owned by Henrietta Hall and ridden by Sarah Invicta Williams of Santa Fe, New Mexico, finished in ninth place in the first round with a score of 154.4, but after earning a Handy round score of 192, moved up to an overall fourth place finish with a combined score of 346.5. Isabelle Potts’ Fusagers Carma, ridden by Jordan Gilchrist of Flower Mound, Texas, had an eighth place finish in the first round with a score of 156 but their Handy round’s score of 187 and combined 343 moved the pair up to a fifth place finish overall. Maddrix and Specialty sat in the third place position after the first round, but after posting a second round score of 174.5, would find themselves moving into sixth place overall. Forte and Vecchia Murano moved from third position to seventh place overall, after earning a second round score of 175 for a combined total of 336. Shepherd and Margaret Camp’s Cascaron finished twelfth in the first round with a score of 149, but after earning a second round score of 183 and a combined total of 332, moved into eighth place overall. The hunter excitement continued as the $2,500 USHJA National Hunter Derby, presented by Tucci, saw nineteen horse and rider teams compete for the win. Just for Now, owned by Lori Matthews and ridden by Courtney Calcagnini of Argyle, Texas, was awarded with the first place honors, followed by Protocol, owned and ridden by Lilah Babineaux of Lafayette, Louisiana. Third place honors went to Redfield Farm’s Quidam, ridden by Kaitlyn Williams, while fourth place was awarded to Carita Palmer’s Grey Goose, ridden by Jason Schnelle of Collierville, Tennessee. Fifth place went to Sabina Holtzman’s Magnus Hermes, ridden by D. Samuel Pegg of Sutton West, Ontario, Canada. Sixth went to Stonebridge Farm’s A Timely Affair, ridden by Sue Takata of Athens, Texas. The Pre-Green Division led off the big hunter numbers for the week in the 3′ section and 3’3″ division. Jacqueline Roberts-McQueen and Holly Calantoni Houser’s Quadrolino led the 3′ Pre-Greens, while Leopold, owned by Grace Gambel and ridden by Livia Steffee, and Amy Ilson Ochoa and Angela Brown’s Turbo alternated first and second place positions in the 3’3″ Pre-Green Division. “We are really excited that riders and owners are earning valuable mileage for their young horses in the $5 Pre-Green Division,” commented Janet McCarroll, Gulf Coast Classic Show Coordinator. “People couldn’t believe that we were offering this division for only $5.00, but by the looks of the entries, I think word has now spread,” she added. “We couldn’t be happier that horsemen are taking advantage of this special offering,” she said. The Gulf Coast Classic Company is a USHJA’s Members Choice Award winner, recognized for producing top quality show jumping events in the United States. 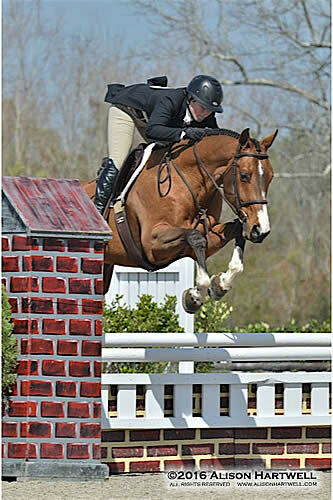 For more information on Gulf Coast Classic Company and its exhibitor-friendly, top quality hunter jumper events, please visit them at www.gulfcoastclassiccompany.com. Mark Bluman and Uitteraard. Photos ©Sportfot. Mill Spring, NC – May 29, 2015 – Tryon International Equestrian Center (TIEC) offered a day of rest from FEI competition today, but that did not stop top international talent from taking to the George H. Morris Stadium in the $5,000 1.45m Challenge. Mark Bluman (COL) and Stransky’s Mission Farms, Inc.’s Uitteraard finished atop the class of 16 entries, crossing the timers in the jump-off round at 33.289 seconds. Sharn Wordley (NZL) and Ashland Stable’s Uppie De Lis finished second with a time of 34.262 seconds, and Shane Sweetnam (IRL) and Spy Coast Farm, LLC’s Beluga placed third in 35.459 seconds. Competition continues tomorrow with the largest class of the week being the showcase $127,000 Kingsland FEI CSI 3* Grand Prix. The grand prix begins at 7pm with doors opening to the general public at 5pm. Bluman, who began riding for the Stransky family at Stransky’s Mission Farms this year, has enjoyed a very successful start to the summer season with top placings aboard several horses, including a top-ten finish in the $34,000 Suncast® FEI Tryon Welcome at TIEC this week. Stransky’s Mission Farms is currently building a summer base in Tryon and Bluman is looking forward to spending his time at TIEC during the summer months. Uitteraard, a 2001 Dutch Warmblood gelding, has an extensive FEI record, competing in competitive international classes throughout his career. Bluman has enjoyed riding the experienced gelding, as he always delivers in the ring. The class saw seven clear trips move forward to the jump-off round, where Bluman was able to ride to the top of the class finishing one second faster than Wordley. He also finished fourth aboard Stransky’s Mission Farms, Inc.’s Copa Cabana. The course was designed by Anthony D’Ambrosio (USA), who has been the course designer for each of the FEI classes this week at TIEC. Bluman is set to ride Stransky’s Mission Farms, Inc.’s Califa LS in tomorrow night’s $127,000 Kingsland FEI CSI 3* Grand Prix. The experience of competing under the lights with a large crowd is always a highlight for Bluman, who is looking forward to riding in the competitive class. He also is aiming his mount Califa LS at the Pan American Games, which will be held in Toronto, Canada in July. Holly Shepherd of Grand Bay, AL and Barbara Risius’ Longstreet scored an impressive 178 in the $2,500 USHJA National Hunter Derby to handily take the class of 23 original entries. Shepherd, who has dominated the circuit so far at TIEC, continues to accumulate top finishes in both the jumper and hunter rings aboard several different mounts. “I’ve been riding him since Gulfport in February and we’re planning on doing Tryon for the Summer Series and then we’ll head to Chicago for the Derby at the end of July and of course Derby Finals in Lexington, KY in August,” she stated. “The big plan is to keep doing really well across the board and in the FEI classes for my jumper horses. We’ll have a pretty light week next week, but I have several clients who are shooting for the moon right now,” she smiled. 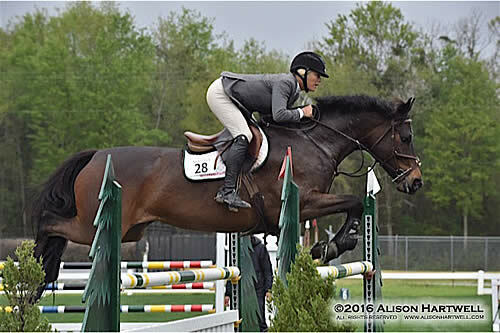 Continuing the season at TIEC is a highlight for Shepherd, who enjoys the convenience the facility offers to riders with horses in both the jumper and hunter classes throughout the day. Margaret Camp and Cascaron finished in second with a 172 and Paige Caskey aboard Waterford VDL rounded out the top three with a total score of 170. Competition continues at TIEC with the highlight $127,000 Kingsland FEI CSI 3* Grand Prix tomorrow, May 30, beginning at 7pm and the $25,000 Grand Prix on Sunday, May 31, starting at 2:15pm. For more information on TIEC and a full schedule, please visit www.tryon.com. Please “Like” the TIEC Facebook page at www.facebook.com/tryonresort to be eligible for various contests and promotions. Holly Shepherd and Belle Clara DKS. Photos ©Sportfot. Mill Spring, NC – May 20, 2015 – Competition was underway at Tryon International Equestrian Center (TEIC) today with the start of Tryon Spring 6, the sixth installment of the 2015 Tryon Spring Series. Holly Shepherd of Grand Bay, AL finished in first and second in the $1,000 Adequan® 1.30m Open Jumper piloting Dejan Krunic’s Belle Clara DKS to first and Loretta Patterson’s Copycat to second place. David Blake of Wellington, FL topped the $1,000 Animo® 1.20 Open Jumper aboard Pine Hollow Farm’s Zelaleen. Tryon Spring 6 will continue through Sunday, May 24, and the Tryon Spring Series will conclude on Sunday, June 7. Holly Shepherd dominated the $1,000 Adequan® 1.30m Open Jumper class at TIEC, finishing first aboard the Belle Clara DKS, riding the jump-off round in 36.65 seconds to secure the win. Shepherd then put in another fast clear round riding Copycat, crossing the timers in 67.246 seconds in the first round and jumping clean in 36.66 seconds in the jump-off, just a hundredth of a second slower than her ride aboard Belle Clara DKS. The class of 25 entries battled for the fastest time around J. P. Godard designed course, which entailed several quick rollback turns, creating faults in several trips. Belle Clara DKS handled the tight course with ease, suggesting good things to come for the pair who has started their week at TIEC in strong fashion. Jordan Coyne, winner of the Tryon Spring 5 $25,000 Under 25 Grand Prix, rode Christoph Schroeder’s Catori to third place, completing their first round in 67.975 seconds and finishing the jump-off in 39.812 seconds. David Blake and Pine Hollow Farm’s Zelaleen topped the first class of the $1,000 Animo 1.20 Open Jumper at TIEC, besting a class of 22 entries. The duo finished the first round on course in 61.457 seconds and completed the jump-off in 40.718 seconds to seal the win. TIEC will serve as the summer base for Blake and Pine Hollow Farm team, as they will continue to compete throughout the remainder of the spring and summer seasons at the venue. This week is their first week of competition at TIEC and Blake was pleased with the course design he saw today. Blake had several rides throughout the first day of competition with mounts in both the 1.30m and 1.40m classes today and is looking forward to the larger classes to come later in the week. Ricardo Villa aboard his own Dulana finished in second place, finishing the jump-off clear in 40.743 seconds and Holly Shepherd with Loretta Patterson’s Win a Date finished in third, completing the jump-off in 41.028 seconds. For more information on TIEC and to learn more about the June 6th schedule, please visit www.tryon.com. Please “Like” the TIEC Facebook page at www.facebook.com/tryonresort to be eligible for various contests and promotions.